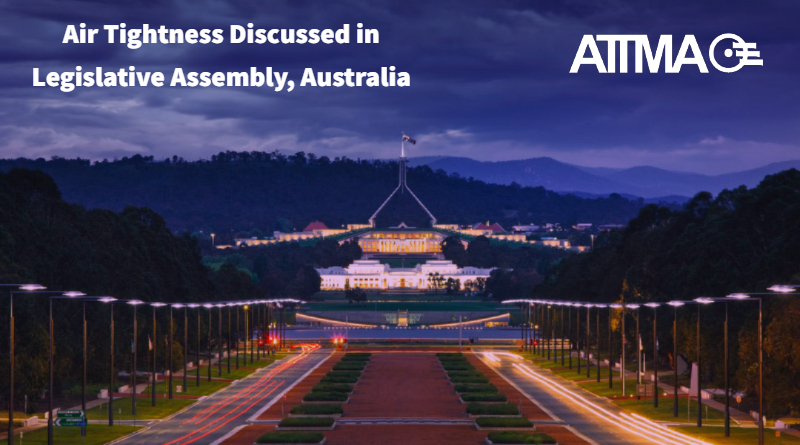 ATTMA was delighted to see air leakage testing being discussed in the Australian Capital Territory (ACT) Legislative Assembly on 20th March 2019. It was as part of Temperature Management Strategies discussion on residential premises. This was due to the summer of 2018/19 being the hottest on record and as they experienced record-breaking heat which may occur more frequently in the future due to climate change. Heatwaves are the deadliest type of natural hazard in Australia so energy efficiency in homes is very important. V2.6.2.3 states compliance with P2.6.1(f) is verified when a building envelope is sealed at an air leakage permeability rate of no more than 10 m3/hr/m2 @50pa. Air leakage was discussed in the Assembly as part of improving energy efficiency in new homes, as it was found out that during last summer, homes that were only 5 years old were barely inhabitable due to the heat, even with air-conditioning in them. Air leakage testing is directly related to energy efficiency due to the design and building of homes. The Legislative Assembly called on the ACT Government to improve designs to reduce summer heat inside new homes. The ACT Government were also called to investigate the expansion of the Energy Efficiency Improvement scheme, so to keep Canberrans cool during heatwaves. Improvements can be made to the Energy Efficiency Rating (EER) system without having to wait for national reform. This could be done by requiring separate national EER rating tool (NatHERS) for winters and summers, or by setting maximum air-leakage standards and basing the ratings on Australia’s future hotter climate.